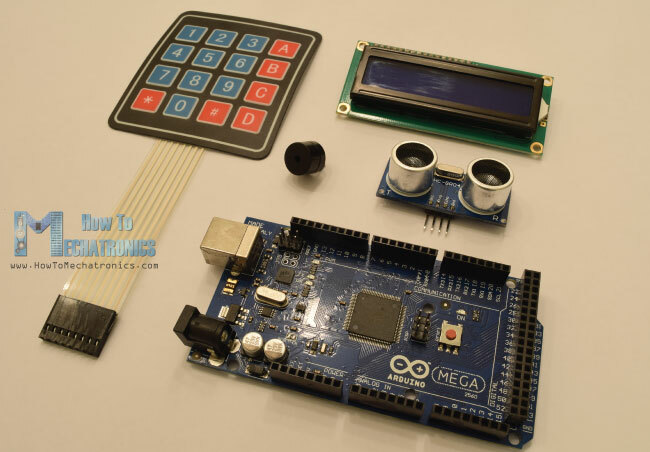 In this project we will learn how to make an Arduino Security and Alarm System. 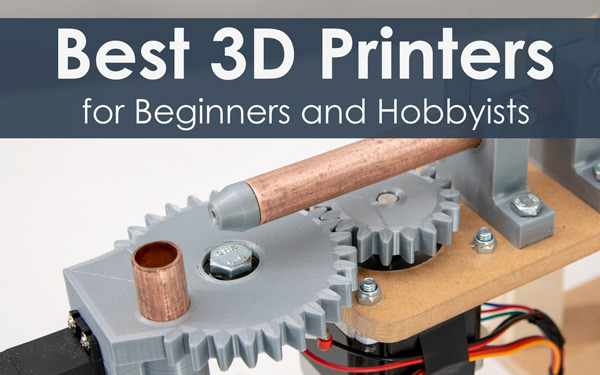 You can watch the following video or read the written tutorial below. The alarm activates in 10 seconds after pressing the A button. For detecting objects it uses an ultrasonic sensor, and once the alarm detect something a buzzer starts emitting a sound. In order to stop the alarm we need to insert a 4 digits password. The preset password is 1234 but we also have the possibility to change it. By pressing the B button we enter the password change menu where first we need to enter the current password in order to continue and then enter the new 4 digits password. Once the password is changed, the next time we activate the alarm, we will only be able to stop the alarm by entering the new password. If we enter a wrong password we will get a message that we need to try again. 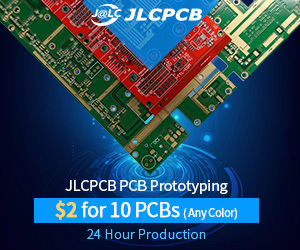 Now let’s see the required components for this project. 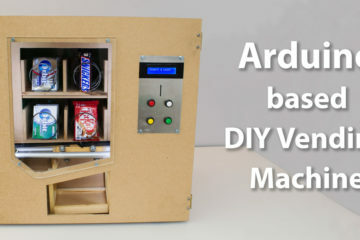 Obviously, we need an Arduino board, an ultrasonic sensor, an LCD display, a buzzer and a 4×4 keypad. So for the buzzer we need just a single pin but one with PWM support. The 4×4 keypad has 8 pins, 4 of them are for the rows and 4 of them for the columns of the keypad. Each button is actually a push button switch which makes a short between one row and column when pressed. So, for example, if we set the row 1 line low, and all column lines high, when we will press, for example, the button 3, due to the short between the two lines, the column 3 line will drop to low so in such a case we can register that the button 3 has been pressed. 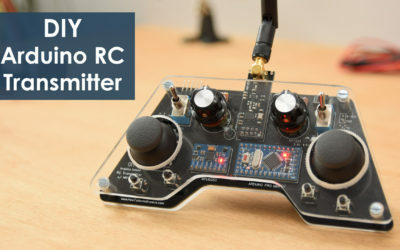 As for the other two components on this project, the ultrasonic sensor and the LCD display, you can check my previous detailed tutorials on how to connect and use them. Next let’s see the Arduino code. As the code is a bit longer, for better understanding, I will post the source code of the program in sections with description for each section. And at the end of this article I will post the complete source code. So we need to include the standard LiquidCrystal library for the LCD and the Keypad library which needs to be additionally installed. Then we need to define the buzzer and the ultrasonic sensor’s pins, define some variables needed for the program, define the keys of the keypad, as well as create the two objects for the keypad and the LCD. 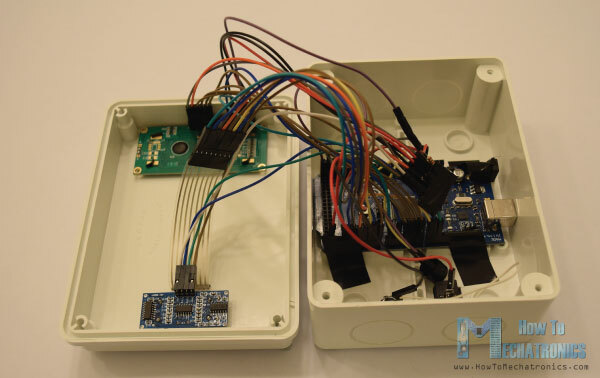 In the setup section, we just need to initialize the LCD and define the pin modes for the buzzer and the ultrasonic sensor. In the loop section, first we check whether the alarm is activated or not. So if the alarm is not activated, on the LCD we will have the home screen of the program which offers two options, A for activating the alarm and B for changing the password. 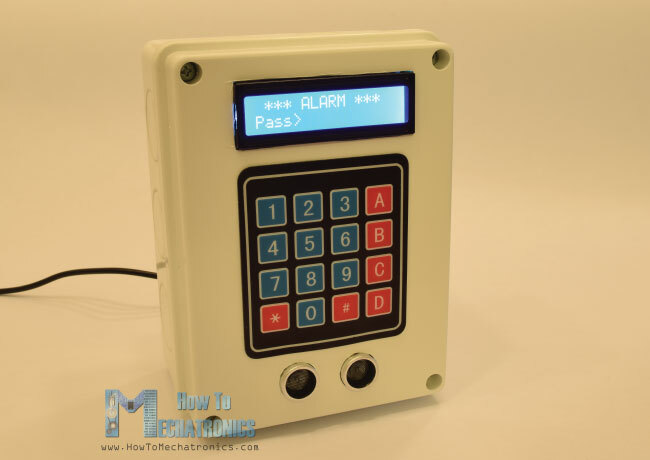 Then using the myKeypad.getKey() function we read which button from the keypad has been pressed and if that’s the button A, the buzzer will produce a 200 milliseconds sound and the activateAlarm variable will become true. In that case on the LCD we will print the message “Alarm will be activated in”, and using a while loop we will make a countdown of 9 seconds before the alarm is activated. Then the message “Alarm Activated” will appear and we will measure the initial distance from our alarm device to the objects opposite of it. So the next step is that the ultrasonic sensor will constantly check whether the currently measured distance is smaller than the initial distance, corrected by a value of 10 cms, and if that’s true it means an object has appeared in front of the sensor and the alarm will be activated. The tune() function will activate the buzzer and the enterPassword() custom function will be called. This custom function will print a message that the alarm is activated and that we need to enter a password in order to stop the alarm. So using the next while loop we are constantly checking whether we have pressed a button on the keypad, and each button press is added to the tempPassword variable. If we enter more than 4 digits or press the sharp button the previously entered digits will be cleared so we can type them again from begin. On the other hand, if we press the asterisk button, we will check whether the currently entered password is the same as the originally set password. If that’s true the alarm will be deactivated, the buzzer will stop producing sound and we will get back to the home screen. But if we entered password was wrong the message “Wrong! Try Again!” will appear and we will have to try to enter the correct password again. For changing the password we use a similar method. Here first we need to enter the current password in order to be able to set a new password. For finishing the project I used a plastic electrical box in which I fitted all of the components and contacted them together. That’s all, I hope you enjoyed this project and feel free to ask any question in the comments section below. I got this error when i tried to verify the codes. Can you please help me with it. You must download and install Keypad.h library first. how to power it without connecting to the computer? 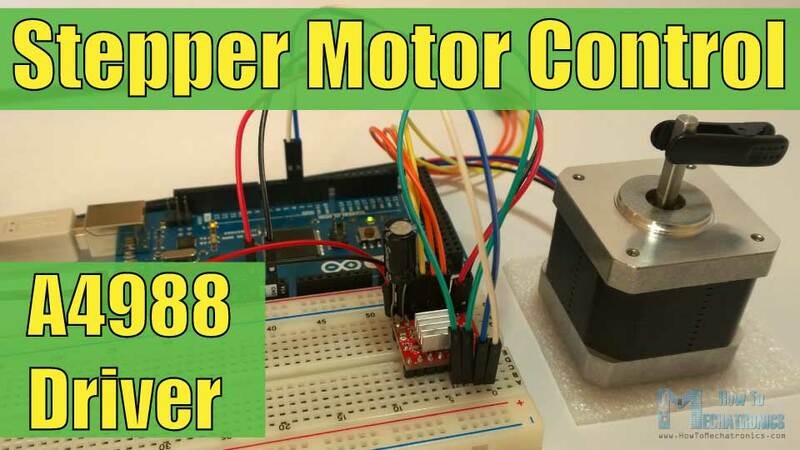 You can do that via adapter, 9 – 12V if powered through the Arduino board power jack, or 5V adapter if powered directly to the 5+ pin of the Arduino. thanks for the response, I modified the lcd wiring connections because I used an I2C . 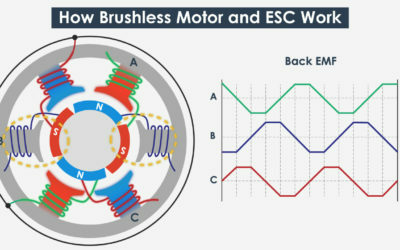 .do I still need a resistor like the schematic u made? in the picture there is a 2 resistors connecting to the LCD…. What power suply you use , how much voltage? DC Adapter 5V 2A. 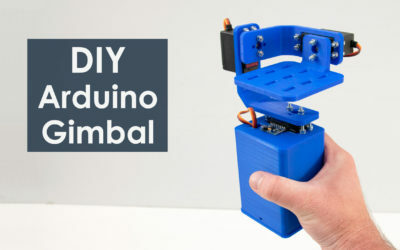 The positive of the adapter needs to be connected to the 5V pin of the Arduino. 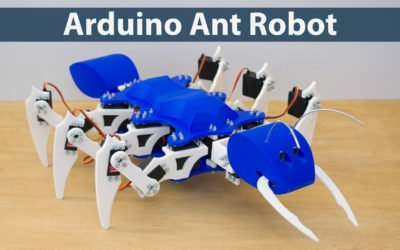 Does this have to use the Arduino Mega or am I able to use the Arduino Uno for this? 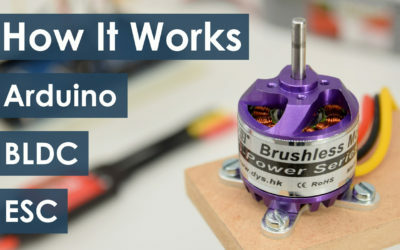 Sure you can use Arduino Uno. uhm sir how many amperes do i use in 9v adaptor? 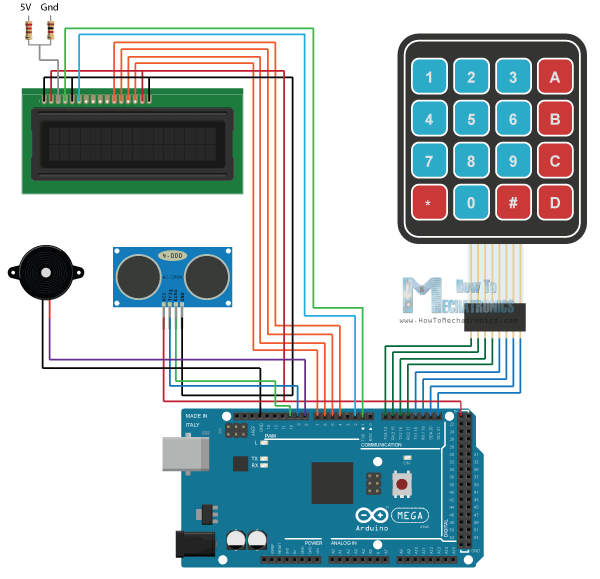 does the Arduino uno have enough pins for this project? Nope, but for example if you use an I2C LCD you will be able to save some pins. Thanks for your creative idea,i done this project with the help of your code. 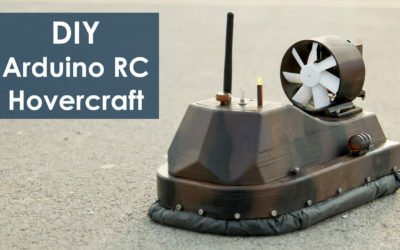 make some more creative in robotics,request from me. Nice to hear that. Thanks for the feedback! Hello, very good! How do I turn on a 5V alarm siren, would it have to be for a relay? Can I connect a PIR sensor in place of the Ultrasonic sensor? 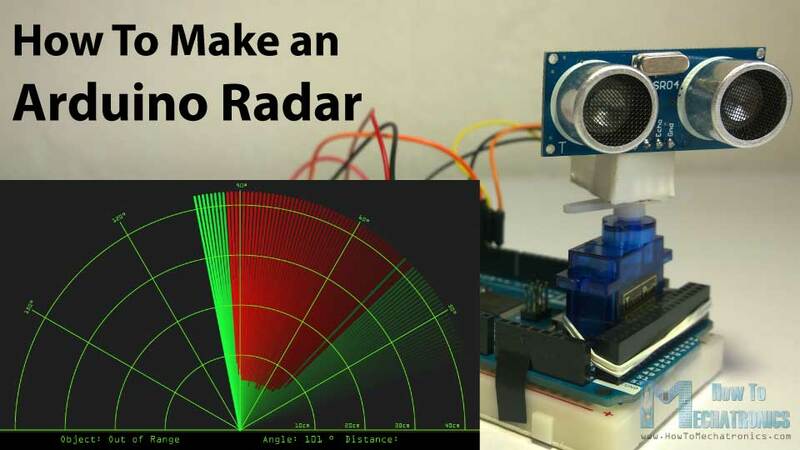 Yes, you can use a PIR sensor instead of ultrasonic sensor. And your alarm siren is 5V you don’t need a relay, as the project is already powered with 5V. Hello, great project! I have a question: How to turn off the alarm before the sensor will detect something? For example, I turned on the alarm but I made up my mind and did not leave the room .. I want to turn it off before the siren goes on, any idea? Hi there and thanks. 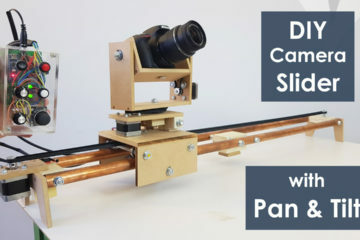 Well for sure you could do that, everything is possible with Arduino. 🙂 Maybe you can add some delay between the detection of the object and the activation of the siren, and in that time enter the password. I already have tutorials on how to use PIR and RFID sensor with Arduino. You can take a look at them and make your own combination. You might be having a problem with the contrast pin of the LCD. Try to use a potentiometer as a voltage divider or different resistor values. I have the same problem. I would like to ask what value of the resistor I will use instead of 220 Ohms? Try several different values for getting the best contrast for you LCD. Values like 220,330 and 1k. Both would work the same. Yeah, that’s a good suggestion. Of course, a lot of different modifications can be implemented. 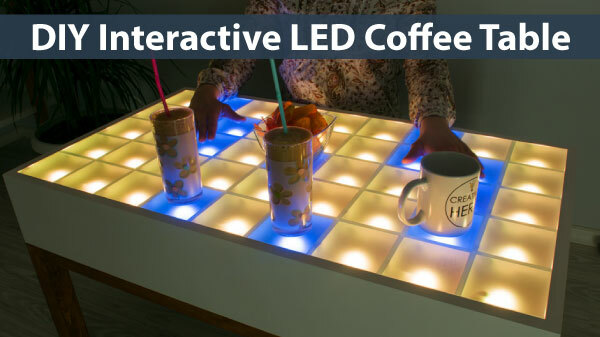 I want to follow up this Project but I have Arduino UNO board. You have already mentioned in the comments that we can use this board too but in Arduino UNO board has not Serial communication female connector that you have used for keypad. 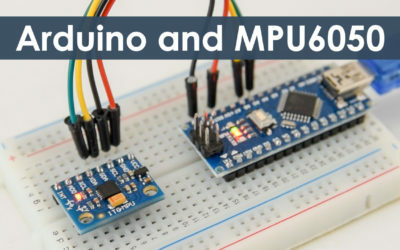 The problem with the Arduino Uno is that you won’t have enough digital pins if you use the components as I used in this tutorial. 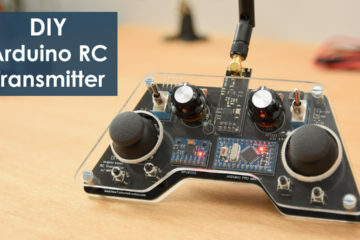 Of course, if you use some different components, like an I2C driven LCD which would use less pins, you could make it work with Arduino Uno and some modification. Thanks for such a great project! What a great example! I stumbled across this about 6 months ago and have since built an entire security system for my garage. I modified the original code to add a 10 second countdown when the alarm is tripped and employed the use of 4 PIR sensors. I’m glad to hear this. Thanks! Hello, I’m interested to do this for my school project. 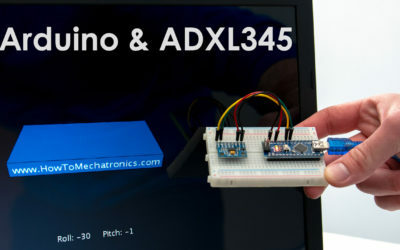 I have all components except the arduino mega but, I have a arduino uno, can I use the arduino uno for doing this project? I’m new in the Arduino area. Sir, what is the two resisters in your circuit diagram, why use it? Please help me. Those resistors are for the LCD brightness. If we connect 5V or 0V(GND) to the Brightness pin of the LCD, it won’t display another. We need to set some voltage between those values of 0 and 5 in order to get a proper contrast, so using the two resistors we make a voltage divider and get a such a value. 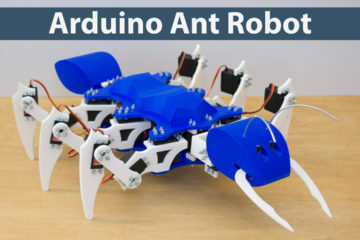 can i use arduino uno for this project. You could use UNO, but it depends what type of keyboard you will use as well as LCD, in terms of pin usage. 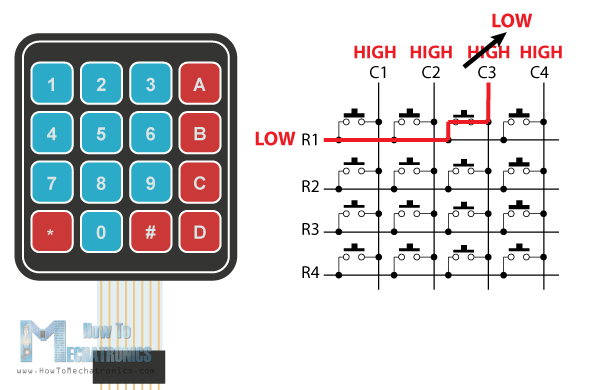 With this configuration you might lack digital pins if using UNO, but in case you use I2C driven LCD or different keyboard you could have enough pins at the Arduino. Absolutely amazing, very helpful, thanks so much!